Renaissance age is known as the emergence of legendary characteristics in art history. We can divide this age to initial Renaissance, middle Renaissance, and advanced Renaissance according to the famous book of the first author of art history, Giorgio Vasari. There were three famous artists (Leonardo da Vinci, Michelangelo Buonarroti, and Raffaello Sanzio) in Italia in advanced Renaissance that their presence dimmed the brilliance of other contemporary artists. These three artists not only are known as the best artists of Renaissance age, but also they are known as the best artists in all history. Artists like Cimabue and Giotto in Initial Renaissance, and artists like Donatello in sculpturing, Brunelleschi in architecture, and Masaccio in painting were the most famous artist, and then, artists like Titian and Caravaggio became famous. Female artists were not accepted by art community in this elegiac era, and couldn’t improve themselves. They also instructed by their fathers and didn’t have the chance to show up in art community. Among them, three female painters (Sofonisba Anguissola, Lavinia Fontana, and Artemisia Gentileschi) became famous with their diligence. In the following, we introduce these three artists briefly. Sofonisba Anguissola was born in an aristocratic and artistic family in Italia, Cremona in 1532. All of her five sisters were painters. A local painter named Bernardino Campi, instructed her to paint and then she started learning painting in Milan. The famous artist, Michelangelo Buonarroti, encouraged her to continue her artistic way after checking her works. Anguissola became famous as a female artist from her youth. Spain king and queen invited her to Spain in 1559. After that, she came to queen's service and appointed as the court painter at the time of Philip II's rule. She spent 10 – 15 years in Spain painting portrait of the king and queen. Then, she came to Italia to start her life in Sicilia. The portraits were her best works. A year before her death, a young Flanders painter (Anthony van Dyck) who became famous later, painted Anguissola's portrait when she was at the age of 92, and then painted her portrait in oil painting. Lavinia Fontana is son of a middle painter, Prospero Fontana, and was born in Bologna in 1552. Her father instructed her to paint, and she created her first work in 1575. She married in 1577; but due to the family life and educating her 11 children, she didn’t quit painting and continued his art life. She became famous because of her portraits and religious paintings, so Pope Clement VIII invited her to Rome in 1603. She also became famous in this city and Pope Paul V and aristocrats supported her. Her works were in Correggio and Parmigianino’s style. She worked and lived in Rome until 1614 and passed away in this city. Artemisia Gentileschi was born in Rome in 1593, and her father (Aurazio Gentileschi) instructed her painting. She started to practice painting by her father’s friend, Agostino Tassi. But he ravished her, and to keep this family’s face, promised her to marry with her. Agostino didn’t keep his promise, so Artemisia’s father complained from him. In this process they tortured Artemisia to get confession. Finally, Tassi convicted and imprisoned. Then, Artemisia started to paint in the field of hero women. 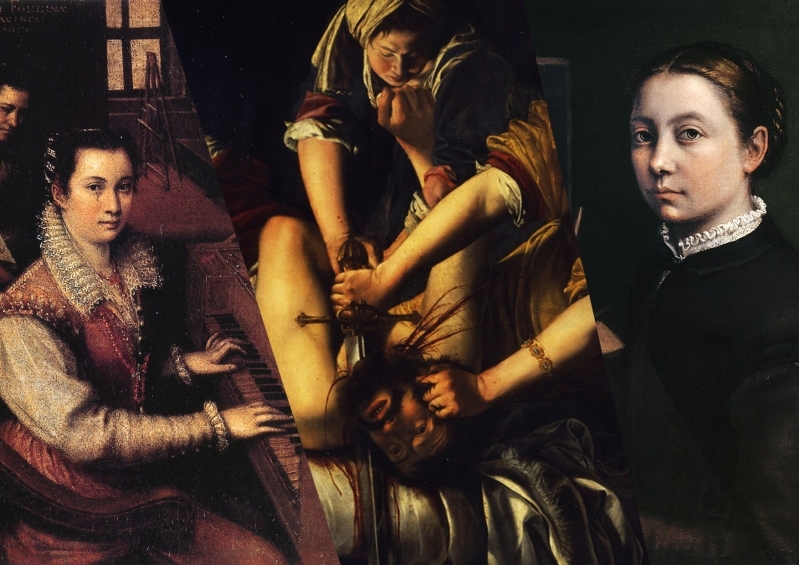 Among them, she painted “Judith Beheading Holofernes” in three copies. These three works were her best works in her art life. Gentileschi wen to Florence in 1614, and appointed as the first female member of Art Academy. She spent 1621 – 1630 in Rome and Venetia, and after 1630 until her death she lived in Napoli, except two years in British royal court. Gentileschi painted in Caravaggio’s (her contemporaneous artist) style, and she is known as a Great Baroque painters.